Home Expert Advice Skincare Advice Acne & Breakouts Does Honey Help With Acne? We understand the desire to try anything claiming to help get rid of acne, and that’s doubly true when it’s an all-natural alternative like honey. But, trying everything can get your skin in trouble—either it doesn’t work or it makes matters worse. Getting a handle on acne is about consistency, not going from one anecdotal remedy to another. That’s where science comes in and that’s where we always go to give you the truth in beauty. The truth is when it comes to honey for acne, the research is pretty clear (no pun intended): Using any type of honey, no matter how exotic, won’t cure or heal any type of acne. However, it can play a role in diminishing the visible signs of acne (such as redness and swelling), but it won’t stop breakouts all by itself. Before you slather on a sticky layer of honey or use a product containing honey on your breakouts, know this: Whether you use raw honey, Manuka honey (or the similar Kanuka honey), or any other form of honey, it can’t do for acne what the gold standard ingredients benzoyl peroxide and beta hydroxy acid (BHA, also called salicylic acid) do. If you decide to go the sweeter route, here’s how to use honey for acne and how it can help fade the look of acne scars (which technically aren’t scars, but are more accurately called post-acne marks). Why Is Honey Good for Acne? The primary reason honey is said to be good for acne is because of its natural antibacterial qualities. Although research supports the value of topical honey for this benefit—mostly in the realm of wound care—honey has not been shown to kill the specific type of bacteria (Propionibacterium acnes) that is the major cause of acne. There are some theories of how honey might work to help acne, but keep in mind that theory is not fact. For example, honey’s possible role in helping acne could be about its ability to reduce water content within the pore lining. The sugars (honey is 69% sugar) literally dry up the water, and with less water, the P. acnes can’t thrive deep in the skin, where acne begins. While there is some logic to that, P. acnes thrives mostly on the excess oil in the pore, so drying up the water doesn’t offer the same pore-penetrating benefits you get from a well-formulated BHA exfoliant. Another antibacterial component of honey is glucuronic acid. This acid is naturally converted to glucose oxidase and, on skin, an enzyme known as catalase converts the glucose oxidase to hydrogen peroxide, whose mode of action on acne is similar to how benzoyl peroxide works. The difference in this case is that hydrogen peroxide is an irritating ingredient that generates free-radical damage. But, even if the hydrogen peroxide were helpful, the amount of hydrogen peroxide you get by applying honey to skin is 900 times lower than what you get from applying the liquid form (such as what you find at the drugstore), which means its impact on acne is practically nil. Another association between honey and acne, which has some validity, is honey’s natural calming properties. The fatty acids, peptides, amino acids, antioxidants, and B vitamins present in honey help visibly minimize the redness common to acne breakouts. These calming compounds can also help hasten the fading of post-acne marks. 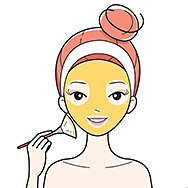 However, there are many other proven ingredients formulated in serums and moisturizers that can reduce the look of redness and are much easier to use, rather than dabbing pure honey on these marks, even if you opt to try a honey mask for acne. Truth: Every natural ingredient is composed of numerous chemicals. Honey is no exception, with most types containing over 100 chemicals! Just as there are good and bad natural ingredients, there are good and bad chemicals. Some of the good chemicals in honey include amino acids, antioxidant compounds known as flavonoids and polyphenols, and minerals. And, as mentioned, one of the chemicals in honey breaks down to hydrogen peroxide on skin (not good). Myth: Honey is great for sensitive, allergy-prone skin. Truth: Although honey has calming effects on skin, the pollens and bee protein that are naturally present in all types of honey can be allergens for some. The risk is low (it’s more of an issue when you eat honey), but honey isn’t completely in the clear for sensitive skin. Myth: Raw honey is the best honey for acne; raw Manuka honey for acne is what to buy. Truth: Research hasn’t shown that there is any one type of honey that is superior for acne or any other skin concern; however, processed honey (the kind sold in most grocery stores) does not have as many beneficial substances. Interestingly, research has shown that the antimicrobial potency of honey varies significantly. Its effectiveness depends on where the honey is sourced, the health and harvesting of the plant, the season, and how it’s stored. Like most natural ingredients, honey is delicate and requires packaging that eliminates or strongly minimizes exposure to light and air.